Browner was credited with 243 tackles, 9 interceptions, and seven fumble recoveries in college and received All-Pac 10 recognition. 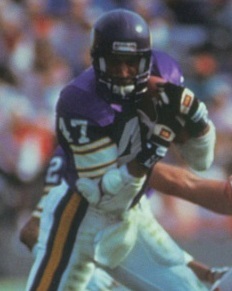 He was chosen by the Vikings in the first round of the 1983 NFL draft (19th overall) and was primarily a reserve in his first two seasons. Browner broke out in 1985, his first full year as the starting strong safety, and was selected to the Pro Bowl for the first of six straight seasons and received second-team All-NFC honors from UPI. Tough, hard-hitting, and with ideal all-around skills at his position, he intercepted four passes in ’86, one of which he returned for a touchdown. Vikings went 8-7 in the strike-shortened season (three games were played with replacement players) to finish second in the NFC Central and qualify for the postseason as a Wild Card. Won NFC Wild Card playoff over New Orleans Saints (44-10) & NFC Divisional playoff over San Francisco 49ers (36-24). Lost NFC Championship to Washington Redskins (17-10). Browner followed up with another outstanding year in 1988 in which he intercepted five passes, accounted for 117 tackles, and was again a consensus first-team All-NFL selection. He intercepted a career-high 7 passes in 1990, but his performance dropped off in ’91, his ninth and last year with the Vikings. He finished up with Tampa Bay in 1992. Overall, he intercepted 37 passes, all with Minnesota, and returned three of them for TDs. Browner also was credited with 9.5 sacks and recovered 17 fumbles. He was a consensus first-team All-NFL selection three times, received at least some first-team recognition after one other season, and was chosen to six Pro Bowls. Browner was selected to the 1980s All-Decade team by the Pro Football Hall of Fame. His brothers Ross and Jim also played in the NFL.